6 boosters issus du JCC Pokémon, dont 4 boosters de Détective Pikachu. ALL INTERNATIONAL SALES, NEW, OPEN BOX, USED ITEM(S), AND DBZ PRODUCTS ARE FINAL. Dracaufeu GX. Dossier Détective Pikachu. 6 boosters issus du JCC Pokémon, dont 4 boosters de Détective Pikachu. Neuf en Français. Dossier Détective Pikachu. métallisée inspirée de Détective Pikachu, 2 boosters. promo de Détective Pikachu en pleine enquête, 1 pièce. de Détective Pikachu du JCC Pokémon, 1 booster. Blister 3 boosters. WOW Warcraft Card - CCG TCG Archives Booster Box (24 Packs) - Opened - All Foil! It's back! Following on from the success of the last two year's collections, Panini is proud to present the all new Panini FIFA 365 Adrenalyn XL Trading Card Collection for 2018/19. There are a total of 396 cards in the collection, with lots of special, foil and transparent cards to keep your eyes peeled for! You will get a playset of complete Core Set 2019 uncommon and common cards. 4 copies of each uncommon in Core Set 2019. 4 copies of each common in Core Set 2019. 4 copies of each basic land in Core Set 2019. POKEMON TCG PLATINUM : DIAMOND & PEARL BOOSTER PACK X 4 - ALL FOUR ARTWORKS! Pokemon TCG. Lord of the Rings TCG. World of Warcraft TCG. Pokemon TCG : HS TRIUMPHANT. Star Wars CCG. Star Trek CCG. Warcraft Minis. WizKids PocketModel. 7 boosters de l'extension Détective Pikachu. 1 pin's de détective Pikachu. Retrouvez-nous sur Youtube . Dragonball Super: Card Game Power Booster Miraculous Revival Promo. Ships Fast in Hand. Dragonball Super Tournament Pack, Event Pack, Super Dash Pack Lot (24). The lot consists of the following: 20 packs tournament pack 4 1 pack tournament pack 3 1 pack event pack 2 2 packs super dash colossal warefare Each pack contains 1 card Free shipping Condition is New. Shipped with USPS First Class Package. This all-new edition promises to take sticker collection to a whole new level and impassion football fans around the world with its outstanding cutting-edge design, in-depth player analysis and individual career highlights. Lot de 7 boosters BT4. État : Boosters neufs et scellés. Condition : New sealed. 1 booster contains 5 cards (see the photos for more precisions). bubble wrap and. Dragonball GT Limited Edition Collectors Tin TCG FACTORY SEALED!!! On the top cover there is a slight dip in the tin on the bottom right. Otherwise it’s a nice factory sealed box!! 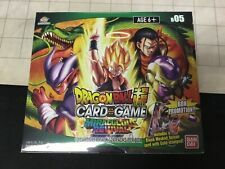 Dragonball GT Limited Edition Collectors Tin TCG FACTORY SEALED!!!. Condition is New. Shipped with USPS Priority Mail. 1 limited Promo card and 1 play manual! Enthält 9 Booster Opus IV (deutsch), 1 Würfel und 1 Cloud-Promokarte. The entire set available to collect from this set contains 211 cards comprising of 60 Commons(Normal or foil ver. )., 30 Uncommons(Normal or foil ver.). Football Cards Stickers. Play Manual. Rage - Booster Box - Limited Edition. Condition : Perfect, original factory sealed, mint! - Limited Edition. - Second Edition. - White Wolf. 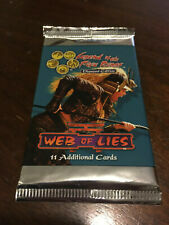 , 30 Uncommons(Normal or foil ver. )., 18 Rares, 14 Super Rares, 2 Secret Rare, 4 Special Rares. Football Cards Stickers. 1 Box Promo: Big Leader Card in Every Box. Cardfight Vanguard. English Edition. Cards are manufactured by Wizard of The Coast - Advanced Level. Star Wars: Destiny - General Grievous Starter Set. Discover an ideal entry point with the General Grievous Starter Set! This 24-card deck provides the perfect place for anyone to start playing Star Wars: Destiny. Quant à la Secret Rare, elle ravira de nombreux nostalgiques et affichera non pas un, mais deux personnage ! Boite scellée. POKEMON TCG PLATINUM : SUPREME VICTORS BOOSTER PACK X 4 - ALL 4 ARTWORKS! Pokemon TCG. Lord of the Rings TCG. World of Warcraft TCG. Pokemon TCG : Platinum Series. Star Wars CCG. Star Trek CCG. Warcraft Minis. WizKids PocketModel. Pokemon TCG. 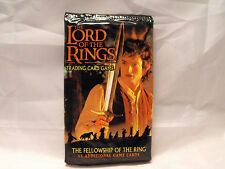 Lord of the Rings TCG. World of Warcraft TCG. Pokemon TCG : Platinum Rising Rivals. Star Wars CCG. 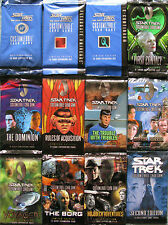 Star Trek CCG. Warcraft Minis. WizKids PocketModel. The cards are in English.